Wind turbine financing and listing your firm on the Frankfurt Stock Exchange to raise capital to install and develop a wind farm takes considerable funds. $100 million financings are available on markets like the Frankfurt Stock Exchange up to $1 billion through FSE Listings Inc’s proprietary partnerships and documentation for listing on the Frankfurt Stock Exchange, financing on the FSE, roadshows in Germany, Switzerland, and abroad for FSE Listings Financing, and networking amongst the energy financing companies and clients whom may be interested. Going public is a great way to finance a wind energy turbine project, in addition, companies can get stand by equity lines of credit to prove cash-flow to the manufacturer once the company is listed on the Frankfurt Stock Exchange. This kind of financing is economical and practical, and can be from $1 million to $1 billion. 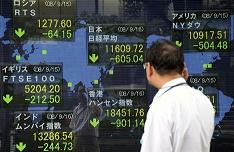 Frankfurt Stock Exchange listings are one of the most practical methods for financing your wind energy project today. Wind power is a complex business that requires complex financers, from financing terms for wind turbines to start-up capital to research the wind patterns and potential of the energy source from your location. These types of projects require a strategy, the right structure, value propositions that are related to an advantage such as wind turbine technology, wind farm location, wind electricity grants and wind energy subsidies, as well as power purchase agreements for wind energy. FSE Listings Inc specializes in working with alternative energy companies and financing firms on the Frankfurt Stock Exchange. Wind Energy Financing is a very popular topic in Germany, where by a Frankfurt listing and Frankfurt roadshow and stock exchange investor relations in Frankfurt would be necessary. Those looking for an FSE Listing require to contact FSE Listings Inc, info@fselistings.com to see if your project qualifies, whether it can be financed, and the best possible strategy for your firm to take in the long term. Green energy financing companies are a large part of the Frankfurt Stock Exchange market that have a green index specifically for targeting investors within your sector. It is no wonder that it is the home of green energy for public listings of green energy companies. FSE Listings work with Green Energy companies, green building, green businesses that make an economic argument and path for succeeding as a business. Green power producers are the alternative energy source that is driving a new trend of investment and investors. Projects take time within this sector, as the resource needs to be identified, the process of extracting the resource, such as measurement of wind flows for wind energy, solar thermal for solar and geothermal heating applications, the flow of the river for run of river hydro projects, the ton’s per day of biomass available for biodiesel firms, all of which is research that costs money. A listing on the Frankfurt Stock Exchange is one of the quickest ways to finance your firm, build credibility, and acquire the much needed funds to take the steps of registering carbon credits, qualifying for grants and subsidies, and building a business that will succeed. 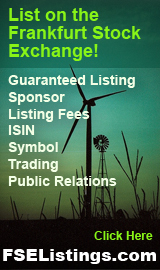 No other listing firm knows the Green energy market place like FSE Listings Inc and financing partner Deutsche Capital Partners A.G.
Where green living and green investing go hand in hand, so does social responsibility of those companies and a footprint that money can buy… through a listing. The reality is, a positive footprint can only be obtained through green living and green investing. Many understand now that just changing the way we live cannot ultimately make the fastest global change, that investing in technologies, processes, and experts within the Green energy market and technologies is the fastest way to make a positive outcome. However, private firms are often too risky, and individuals are risk adverse even when they are charitable. The green investor is an educated market that however charitable they may be, they also want to make a profit, make sure you build and do what you say you will, and can show the difference financially as well as changing the world for the better. A website and presentation suited for this market and a listing on the Frankfurt Stock Exchange is the ideal tool for capturing that interest and bringing in financing that feels comfortable with your firm. Power companies in general are at a disadvantage to your alternative energy company if you can deliver the presentation, the resource, and the returns. The security of a listing on the Frankfurt Stock Exchange and DAX is that ability to offer a public measuring stick of value, liquidity, and prestige. A Frankfurt listing is what you need for your alternative energy company. There will only be renewable resources on earth if someone develops them, the best way to do this is with a market that believes in your firm, FSE Listings is the best way to get there. Energy finance is available for green energy companies by way of grants, subsidies, selling of shares on the public markets, debts, and carbon credits. Lets build the best plan in the world to help you finance an energy company now! Becoming an electricity provider, technology provider, and consulting firm in the Green Energy sector is exciting, fulfilling, and profitable. We understand your market, contact us to see how we can help you today! We know the green energy organics of building a successful business, the green energy options for financing, the green energy investing strategies of your target market, and the way to build and list green energy stocks and green energy public companies… we leave the green energy expertise and engineering to you and your team. Contact us today! Whether you are a hydro energy company, wind energy company, solar energy company, oil company, coal electricity producer, green energy company, hydro energy or water energy company, biofuels firm, biodiesel firm, waste to energy firm, tidal energy firm, geothermal firm, natural energy firm, hydrogen energy firm, lithium fuel cell firm, fuel cell firm, radient energy firm, viridian energy firm, natural gas energy firm, biomass renewable energy firm, or any energy source firm, you have an active market looking to invest in your firm called the Frankfurt Stock Exchange. The third largest stock exchange in the world, and one of the leading energy markets for investment. It is no secret that Germany has some of the largest investment forums and a history in supporting their engineers and markets for investment in the Energy sector. Financing energy firms is best done with professionals who understand the market. 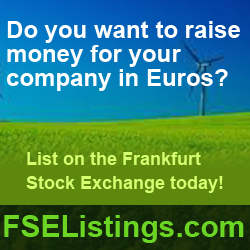 FSE Listings Inc is a leader in listing, financing, and merging energy companies on the Frankfurt Stock Exchange. With partner firm, Deutsche Capital Partners AG, we develop the best possible strategy for financing, gaining investment, registering for subsidies, grants, and carbon credits, and ensuring an active trading market of the company’s shares to finance future growth and create a liquid presence for shareholders and founders alike. FSE Listings offers no risk options as the first firm to offer escrow services to their clients so that no funds are released until listing and the listing is Guaranteed! Or you can list on a pay as you go process starting at only 20k Euro! 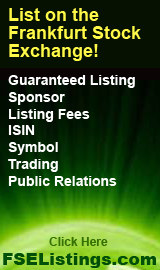 List your company Fast with FSE Listings! The shortest listing completed by FSE was 10 days! However we generally quote between 3-6 weeks. Within the companies listed in 2011, none of the listings took longer than 5 weeks!